Located near the intersection of W Beardsley Rd and N Lake Pleasant Rd, Extra Space Storage serves residents of Peoria, Sun City, Sun City West, Surprise, and El Mirage. Locals will recognize our facility next to Walgreens a few minutes west of Parkridge Elementary School. Offering a wide variety of storage units, climate-controlled storage, drive-up access, and exceptional security, Extra Space Storage on W Beardsley Rd is the storage partner you can trust in Peoria! Whether you're storing residential or commercial items, we have options to meet your needs! 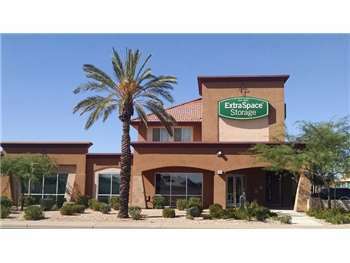 Our Peoria storage facility has units from 5x4 to 20x30 with convenient features like indoor access, first-floor access, drive-up access, and more! Spotless, safe & a helpful polite staff. The location on Beardsley in Peoria, AZ is very nice & very clean. Sonia has the best customer service skills and treats you like a friend. Was able to get the unit I needed on short notice. It's inside and climate controlled. The units and entire site is super clean. Sonja was great to work with. The staff working at Extra Space Storage (off of Beardsley & 103rd Ave), made my first experience renting a storage unit a GREAT one. They clearly explained the rental process slowly, in detail, from beginning to end. The units (inside and out) are always kept clean, plus, all units are easy to get into, and out of. The staff seems to always be smiling and cracking jokes (they try anyway). I would recommend renting storage units from them to anyone, young and old. The facility hasn't seemed to change in the few years I have had my unit. Facility appears to be clean and well maintained. My only gripe is the every six month rate increase levied due to Market Rate Increase which is just a fancy way of saying they are screwing you. Exhibit A when I leased my unit two years ago I paid $165 a month now I'm paying over $230 a month. Sadly I'm not receiving any additional services for the increase...legalized extortion! EXTRA SPACE was recommended by my son, the price & location were perfect for me. The attendant Mike at the front desk was very informative, polite & helpful. I feel that I made a great decision for my short term storage needs. I have an inside unit here and am thrilled with it, very convenient, staff is friendly and customer service oriented. I wouldn't go anywhere else. I have had storage units at other facilities in the past, This one seems to be the cleanest and most secure I've ever had. So Far So Good!!!! I've only been there a couple of months. Just west of 99th Avenue on Beardsley, next to the Walgreen's. Drive south on N Lake Pleasant Pkwy. Turn right onto N Lake Pleasant Rd. Turn right onto W Beardsley Rd. Our facility will be immediately on your right. Drive north on N 99th Ave. Turn left onto W Beardsley Rd. Our facility will be immediately on your right. Drive west on W Beardley Rd. Pass Parkridge Elementary School and continue straight. Our facility will be on your right after Walgreens. Drive east on W Beardley Rd. Our facility will be on your left just before Walgreens.